Three day old baby chicks pecking at food. A new batch of baby chicks arrived at Bee Heaven Farm this week. The little peepers hatched last Monday and arrived in the mail on Thursday. Yes, baby chickens travel by mail! The post office called Farmer Margie at 6:30 in the morning to come pick them up. They were packed tightly in a cardboard box with lots of air holes. They kept each other warm with their own body heat while traveling. So far it looks like all survived the trip. 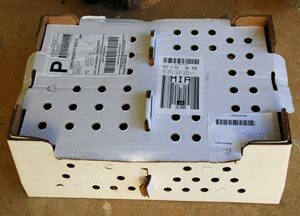 How baby chicks travel through the mail. Farm interns Sadie and Mike immediately started holding and cuddling the baby chicks. There’s something about handling the little birds, or just watching them peep and run around, that’s mesmerizing. What’s not to love? They’re so cute and fluffy! 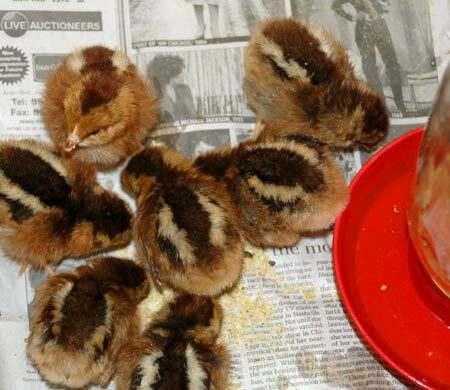 The chicks will have no problem getting socialized with all the attention they’re getting. Mike and Sadie playing with chicks. Margie got two heritage breeds. The black chicks are cuckoo maran and the brown chipmunk-looking ones are welsummers. When they grow up to be 4 to 6 months old, the hens will lay chocolate (dark brown, that is) eggs. This week 25 chicks arrived, and next week 25 more are coming. Farmer Margie is getting that many birds to replace those killed by feral dogs this past season.